Liverpool to make January move for Napoli marksman? Liverpool are reportedly weighing up a winter deal for Lorenzo Insigne as they seek to bolster their frontline further to enhance their title prospects. The Reds are currently sitting with a four-point advantage at the top of the table while they have also progressed to the knockout phase of the Champions League. 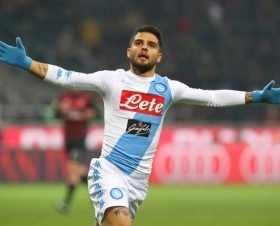 Amidst this, the likes of Mohamed Salah, Roberto Firmino, Sadio Mane and Xherdan Shaqiri have all been in good form for the Reds but according to Calciomercato, a deal for Insigne is being considered. It is added that the Merseyside giants could shatter their transfer record for the experienced forward with a potential fee of £90m prepared to tempt Napoli into a mid-season sale. Insigne has contributed 10 goals in 22 appearances for Napoli, who are currently second in the Serie A standings. The Italian was on the scoresheet against Liverpool during his side's slender 1-0 win at the group phase of the Champions League this term.